If you are considering collecting vintage Yashica cameras, the good news is that there are many fine cameras to collect! Starting out making cameras as the Yashima Optical Company sometime around 1953, Yashica made their name with Twin-Lens Reflex (TLR) cameras, of exceptional quality. Yashica purchased Nicca (maker of superior Leica copies) in order to break in to the 35mm market, which it did with an impressive range of rangefinder cameras. SLRs followed in 1960. 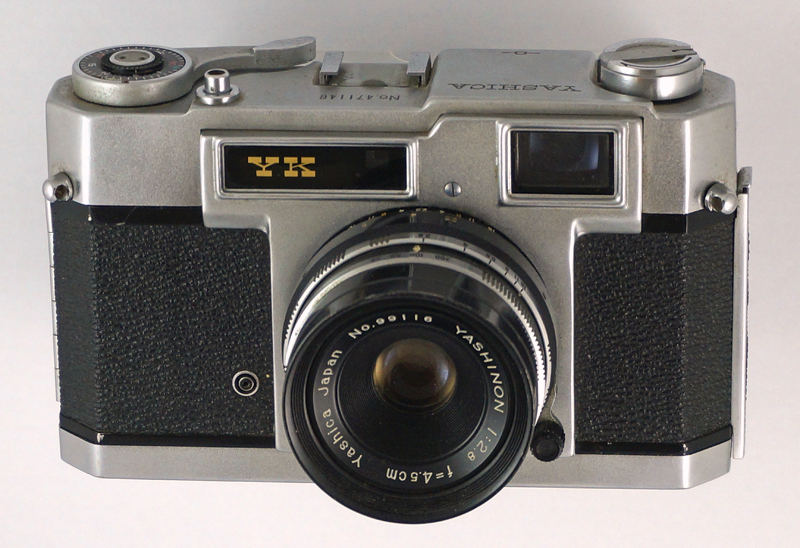 By 1974 Yashica were manufacturing ‘Contax’ branded SLRs, to cash in on the German company’s once-impressive name. In 1983 Yashica was taken over by the Kyoto Ceramic Co. Ltd (Kyocera), a manufacturer of printed-circuit board material. The company went on to produce some fine cameras, such as the advanced (but oh-so-heavy) 230-AF SLR, and various APS compacts, until production ceased in 2005. Yashica still exists as a Hong Kong-based company, but what they make I know not. A very well-built rangefinder camera, with more than a hint of a pre-war Contax II, somewhat appropriately.